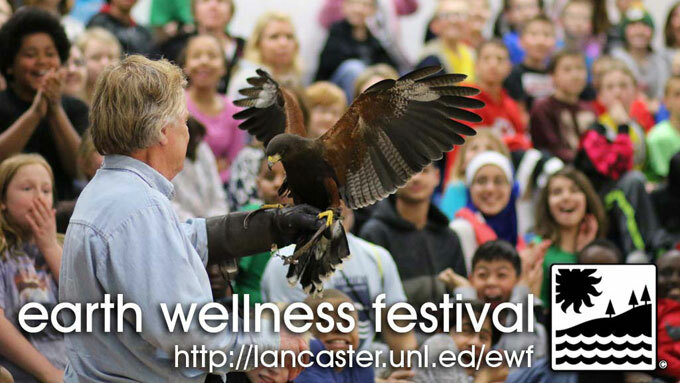 earth wellness festival is an annual event offered to fifth-grade students of Lancaster County, Nebraska. This environmental education program was conceived in 1994 as the result of a petition request of 325+ local teachers who wanted an environmental festival in their own community. Today, earth wellness festival has impacted nearly 70,000 youth. Students attending earth wellness festival experience science as an essential and exciting part of their lives. The festival is a culminating event reinforcing concepts introduced to students through current environmental curriculum like 4-H school enrichment. The festival provides students with a 25-minute creative and "hands-on"/engaging learning experience in each area of water, land, air and living resources. The students participate in a culminating activity with raptors from the World Bird Sanctuary from St. Louis, Missouri. earth wellness festival organizers work closely with local schools to ensure the activities and materials correspond with their fifth-grade curriculum. Educators, environmentalists and government representatives are utilized as over 200 presenters and volunteers for earth wellness festival. Kits For Kids: earth wellness festival fosters year-round opportunities for students and teachers to link environmental issues with science-based curriculum. In October, a unique pre-festival learning kit is provided to classrooms attending the festival. Each kit contains curriculum and all the supplies (beans, rocks, vinegar, flashlights, magnifying glasses, pH paper and more) needed to complete 20+ activities covering topics in soils (land), water, air, living resources and impact. Walk the Talk: A recycling program implemented at the festival substantially reduces waste generated by participants. An attractive station located in the college cafeteria collects recyclable items. Festival organizers, with the help of many supporters, are able to practice what they teach. Be an earth wellness festival volunteer! Each year, over 50 volunteers take part in earth wellness festival activities. As classroom guides, volunteers are essential to the success of this event. In return, you receive the opportunity to participate in a rewarding volunteer experience, a festival T-shirt, coffee, rolls, and lunch. We are now taking on-line registrations for the 2019 earth wellness festival - Deadline is February 24, 2019! 2016 earth wellness festival "Turtle Talk"
2016 earth wellness festival "Endangered Species"
Each year, more than 200 volunteers take part in earth wellness festival activities. As classroom guides, volunteers are essential to the success of this event. In return, you receive the opportunity to participate in a rewarding volunteer experience, a festival T-shirt, coffee, rolls, and lunch.